Senator Lambies brain humbly take all the credit for the recent crack down on terror cells in Australia. “clean up the rubbish in our own backyard before we try to clean up the rubbish in others”. and ordered the rubbish removal straight away. Thank you Jacqui , the world is truly a safe place thanks solely to you. 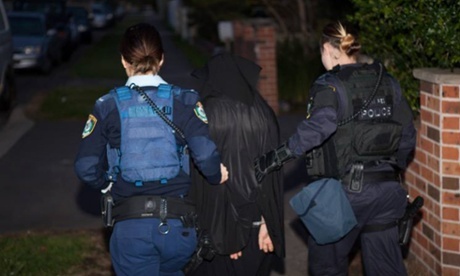 I assume Senator Lambie cannot tolerate the intolerance and fundamentalism she thinks goes with Sharia law. As kicking someone out of the country for a set religious belief they aim to adhere to is no way fundamentalism or oppressive. As us Aussies are very tolerant and open minded, as long what you believe is pretty much the same as us. She also has no problem using dehumanising language calling people “Rubbish” which of course means these are people we can just dump, destroy or discard without a second thought either here or abroad. She also forgot mention granny Lambie use of leaches to cure a flu and good old exorcism to deal with mental illness.Or maybe she was an actually wise old lady and was instructing Senator Lambie to clean the rubbish in her own brain, before she lectured others on their beliefs. 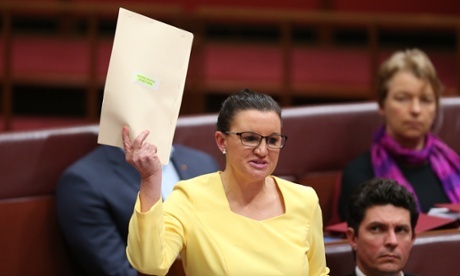 Senator Lambie would be pure comedy gold if she didn’t hold a position in public office and had people actually listen to her. What is sad and disturbing about Lambie’s views is they do reflect a large segment of the Australia population that are frighten and racist. She is voice of the unspoken anger and hostility that “our” country, a country created when we invaded and decimating the indigenous population 220 years ago, is being taken over by “people who are not us.” In thinking terms it’s the crudest and lowest common denominator, the Jerry Springer of public opinion, exalted as something other than the crass ignorance that it is. Thanks Senator Lambie, you make me so proud and entitled to be a deluded racist Aussie. This entry was posted in Media, Memes - Australian Politics, Self & Society. Bookmark the permalink. A beacon of hope to Australia!! to the world Tim, the whole wide world.